Are you suffering from pain in your neck and shoulders: stiffness, restricted movement, headaches? Lingering whiplash symptoms from an injury many years ago? Thorough assessment is the first step to putting together an effective treatment plan. Postural analysis and muscle testing highlight how you use your body and why and where imbalances may be occurring. Treatment focuses on relieving pain, improving movement and setting clients on the path of long term recovery. We are not looking to rub the pain away for the short term as some massages do – we are looking to make changes that last. Whiplash can affect people for decades after the initial trauma. The brain’s motor control centre senses vulnerability at the time of injury and will shut down movement to protect the brain and spinal cord. However, once the injury is healed these movement patterns often remain stuck and this becomes the residual problem. Typically, the neck flexors become weak and the neck extensors fiercely strong and overworked – causing the typical symptoms a long-term whiplash sufferer will describe. Massage can release the tight muscles and neurokinetic therapy can activate those which are inhibited – resetting the faulty movement pattern in the brain. Is the way you breathe contributing to your neck pain? We take 25,000 breaths a day and if you are breathing through your chest and neck there is good news- re-educating your breath will bring great benefits. Forget that six-pack; it is proper breathing which builds strength and transmits power throughout our bodies. It can have a profound affect on neck and shoulder tension – in fact, proper breathing helps ALL chronic pain. Postural considerations: How do you sit, how do you walk, how do you sleep? 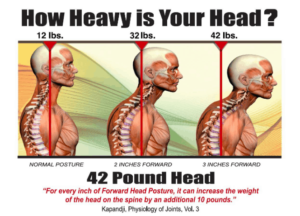 Is your neck compensating for lazy glutes? Do you have a pelvic tilt which is affecting your neck? Is your neck trying to stabilize for something going on elsewhere in your body? Root cause is not always at the site of pain. If you are looking for help with neck pain, whiplash injury and/or headaches, call 01273 729691 or book online.